Bethany means 'place of the poor' so when Mary poured a bottle of perfume on Jesus feet which cost a year's wages, the point was made that it was a very extravagant gesture. The disciples would have been aghast at the generosity of it all, but they also thought that the money could have been put to better use. But Jesus had just raised her brother from the dead, a house of mourning had been turned into a house of joy. Mary would have given Jesus anything and everything, this was not time to count the cost, he was worth her all. Her actions showed that she loved Jesus more than any of the disciples could even imagine. They might say that they loved Jesus, but which one of them was prepared to be as generous as Mary? So how much of a sense of gratitude do you have towards Jesus. What is the amount which you are prepared to give? The message this week is a challenging one. Jesus does not want us say that we love him, he wants to see us show the same unreserved love as Mary. He was pierced for our transgressions, he was crushed for our iniquities; the punishment that brought us peace was upon him, and by his wounds we are healed. Bethany means ‘place of the poor.’ In our Bible passage Jesus is anointed with really expensive perfume an action which might be considered totally unsuitable in a place of poor people! Jesus came to Bethany, the home of Lazarus, whom he had raised from the dead. This house should have been a house filled with mourning and sorrow, instead it is the centre of attention as the dead man and his saviour gather to eat. The people around would clearly want to see this Lazarus who had been raised after four days. Bethany is a small village only a couple of miles from Jerusalem and it would also have been crowded with pilgrims who had come to observe Passover in Jerusalem at this time. People would also have wanted to come closer to Jesus who had this extraordinary power over death, they would have wondered what he could do for them also? Jesus is with Mary and Martha and Lazarus, who he raised from the dead. Mary, the same Mary who had sat at the feet of Jesus as her sister Martha had been 'distracted with much serving, is once again centre stage. Once again Martha is serving, and once again Mary is rapt with love and devotion, sitting at his feet. But now Mary springs into action. In one spontaneous, reckless and, some would say wasteful gesture of extravagance, she anoints the feet of Jesus with expensive perfume and wipes them with her hair! It's a very sensual, a very intimate, and a very shocking scene. For a woman to let her hair down in public in this way and behave towards Jesus with such physical intimacy must have aroused considerable attention and scorn. To let down her hair and massage the feet of Jesus with perfume is quite a highly charged act in any culture, but at the time it was positively outrageous. We can all imagine how the disciples must have wanted to have a go at Mary for being such a tramp and behaving in this shameless fashion. Remember, this was no ordinary bottle of perfume but rather one costing a years salary. Can you imagine what you would have said had you witnessed this scene of such lavish adoration? Judas beat us all to it when he complained about apparent waste, claiming that the money could instead have been given to the poor. In Mark’s Gospel too he records that it was "some who were there" who protested. (Mark 14:4), not just Judas! Truthfully all of us would be appalled when we heard about this lewd behaviour and flagrant waste. Everybody except Jesus. Jesus defends Mary: "Leave her alone, " he says. "She is anointing me, making preparations for my death. " Jesus knows how much Mary loves him, and he recognises the goodness in her devotional act of extravagant love. She loved Jesus, and she poured out her love like priceless perfume, like there was no tomorrow, without ever counting the cost. The perfume Mary poured out was worth a year's wages, would we be prepared to pour out that kind of money on somebody we love? Would we be prepared to pour it out on Jesus? Mary had much to be thankful to Jesus for, he had raised her dead brother Lazarus from his stinking tomb, how could she deny Jesus her best perfume? What Mary did was highly provocative, but she was highly motivated and her spontaneous act of loving gratitude could not be inhibited by social etiquette. Mary responds to the love and acceptance she found in Jesus. Her affection for Jesus is an example to us all. It is not the time to talk budgets, but to show love. What Mary did was outstanding. She gave Jesus not just words or promises about her love. She put those words into direct action. She did not consider the cost because her love was greater than financial considerations. We need so very much to learn the lesson which Jesus understood about generosity when he publicly approved of what she did. The woman’s response stands in contrast to that of the Chief Priests and Judas who will serve them in their wicked murder of Jesus. It is also a contrast to the behaviour of Peter and the disciples. In the Gospels Jesus is pictured as abandoned by his inner circle of disciples. In the end it will be a few women who are left standing near Golgotha and who will venture to the tomb. The unlikely ones in Mark and John’s world, the women, become the models. This is a deliberately subversive passage, and reflects so much of the experience of Jesus’ ministry. Others were so good, so devout, and so busy trying to be holy that they missed the point. This action made by the woman when she breaks the perfume container open and spreads the contents over Jesus’ feet, speaks louder than a thousand words. Mark even suggests that Jesus predicted how memorable her act would be. Jesus was surrounded by many of noble lives, high religious prestige and good moral deeds. It was none of these which attracted him, nor those who like Peter spoke strongly of their unswerving loyalty. Mary had faith in Jesus and she put that faith into an act of extravagant loving devotion. In so washing his feet her actions spoke louder than words, she showed that love which is beyond that which words can express. Grant to us, O Lord, fullness of faith, firmness of hope and fervency of love. For the sake of the gospel may we sit loosely to our wealth and daily embrace you in the poor of the world. As we rejoice in your generosity so may we give ourselves in the service of others; through Christ our Lord. Amen. God our Father, we come today to worship you and confess that devotion to you is often far from our minds. This morning may we refocus our attention upon our love for you and how we show that love. Help us Lord to be more willing to pour out our lives as fragrant offerings of love. We lay our lives before you and ask that we might know that love which does not count the cost. Lord God, as we wait upon you now, as we listen for your voice in the silence of hearts and as we offer our prayers to you we think of those people in our lives who have loved us with a generous love we think of those who like Mary have not counted the cost of what they have given us; of those who given all of themselves to us as Christ gave himself for the world; and we thank you for them - and ask you to bless them and for you to make us like them. As we go into this week, O God, help us to have a focus, a purpose that is beyond that of just getting by; beyond that of just trying to make it through another week; show us we pray what you would have us do; reveal to us our own personal and unique ministry—and help us to do it. Bless O God those in our midst and those around the world whom we name in our hearts before you at this time; we especially ask for those who are poor in the basic needs of daily living; and for those who are poor in love; hear too the prayers we ask for those who need healing or hope in their lives, those who need justice, and those who require mercy. Here is another Bible story about greed, betrayal and love and sacrifice. Picture the scene; Jesus has raised Lazarus from the dead and now he is eating with him and his sisters Mary and Martha. What should have been a house filled with mourning and sorrow is instead the centre of attention as the dead man and his saviour gather to eat. The people around would clearly want to see this Lazarus who had been raised after four days, they would also want to come closer to Jesus who had this extraordinary power. Who knows what he could do for them also? This provoked the Jewish chief priests and we are given a glimpse of why they want to have Jesus and Lazarus put to death. Simply they are envious and greedy and do not want Jesus to take over their religious authority. Jesus was just too popular and this would have implications for them and their status in the community. There was no answer, Jesus had to go. In this scene we find also Mary who does something quite remarkable. She takes some perfume and breaks the jar open to pour it all over the feet of Jesus. This was no ordinary bottle of perfume but rather one costing a years salary. Can you imagine what you would have said had you witnessed this scene of such lavish adoration? Judas beat us all to it when he complained about apparent waste, claiming that the money could instead have been given to the poor. The money is in some ways incidental, the focus of this story is the woman a person responding to the love and acceptance she found in Jesus. It is not the time to talk budgets, but to show love. The woman’s response stands in contrast to that of the Chief Priests and Judas who will serve them in their wicked murder of Jesus. It is also a contrast to the behaviour of Peter and the disciples. In the Gospels Jesus is pictured as abandoned by his inner circle of disciples. In the end it will be a few women who are left standing near Golgotha and who will venture to the tomb. The unlikely ones in Mark and John’s world, the women, become the models. This is deliberately subversive and reflects so much of the experience of Jesus’ ministry. Others were so good, so devout, and so busy being so, that they missed the point. This is grindingly obvious, when a woman like this inarticulately breaks the perfume container open and spreads the contents over Jesus’ feet. Mark even suggests that Jesus predicted how memorable her act would be. Those of you who watch ‘Friends’ and who are up with the latest series, will have watched the episode recently where Phoebe and Mike are planning their wedding. It is all going to cost so much that Phoebe decides that they should write out a cheque for the full amount and take it as a gift to a children’s charity. The extravagant cost of the wedding can do so much for the poor children. Then after a time to consider what she has done, Phoebe returns to the charity and asks for her cheque back. She has a terribly torn conscience because although she really wants to help the children, she also wants to be able to celebrate her wedding. She wants the day to be extravagant because it is an important day for her and Mike. Fortunately for Phoebe, the man in the charity office forces her to take back the cheque and she promises she will give to the children at another time. The truth is that we all find it much easier to accept generosity and to justify extravagance when it is shown towards us. We can convince ourselves that we really do need an expensive holiday, a new car or private health care. However the Puritan within us all is much more critical when it comes to the expenditure of others. We have been dismissive of the financial priorities of other people. Surely there is no need for people to waste money on fripperies like Gucci scarves or a couple of thousand pounds on a case of Chateau Lynch Bages? But then we have to deal with the Gospels, where Jesus makes it just so difficult to be sensible about expenditure. He seems to delight in waste and extravagance, like the time when he not only fed the hungry crowds, but he went and made too much food and there were basket left over. Or the time when Jesus turned water into wine, not just a little wine but 180 gallons of it, when everybody had already been drinking too much and it was good wine! So too in the lesson today we have another example of a generosity too far. Jesus came to Bethany, the home of Lazarus, whom he had raised from the dead. Bethany is a small village only a couple of miles from Jerusalem, and it would have been crowded with pilgrims who had come to observe Passover in Jerusalem. Bethany means ‘place of the poor.’ At Bethany Jesus is in the home of Mary and Martha and Lazarus, who he raised from the dead. Mary, the same Mary who had sat at the feet of Jesus as her sister Martha had been 'distracted with much serving, is once again centre stage. Once again Martha is serving, and once again Mary is rapt with love and devotion, sitting at his feet. But now Mary springs into action. In one spontaneous, reckless and, some would say wasteful gesture of extravagance, she anoints the feet of Jesus with expensive perfume and wipes them with her hair. It's a very sensual, a very intimate, and a very shocking scene. For a woman to let her hair down in public in this way and behave towards Jesus with such physical intimacy must have aroused considerable attention and scorn. It is a curious human trait that we so often criticise in others, behaviour which we secretly find exciting ourselves. Read the tabloids and you see page after page of editorial exposing the shameless behaviour of those caught out, especially in sexual indiscretions. And it is all told in full detail with pictures! Are we all such obvious hypocrites? So we can imagine this scene when Mary started performing such overtly sensual and improper gestures over the body of Jesus. 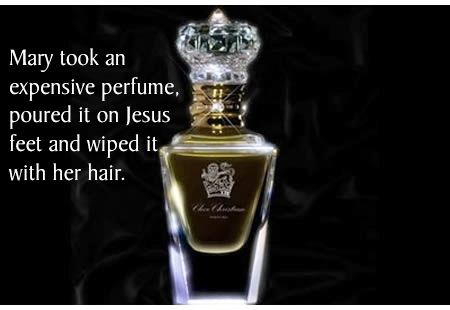 To let down her hair and massage the feet of Jesus with perfume is quite a highly charged act in any culture, but at the time it was positively outrageous. It might not have been the done thing to criticise Jesus, but how the disciples must have all wanted to have a go at Mary for being such a tramp and behaving in this shameless fashion. 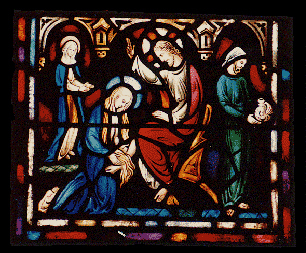 Jesus defends Mary: "Leave her alone, " he says. "She is anointing me, making preparations for my death. " Jesus knows how much Mary loves him, and he recognises the goodness in her devotional act of extravagant love. She loved Jesus, and she poured out her love like priceless perfume, like there was no tomorrow, without ever counting the cost. The perfume Mary poured out was worth a year's wages, would we be prepared to pour out that kind of money on somebody we love? Would we be prepared to pour it out on Jesus. If we let our heads rule our hearts, we would never build beautiful churches with spires and steeples, never have stained glass or a silver chalice. There is a part of us all which is begrudging and miserly and which can always suggest a better way to spend money. What this woman did was outstanding. She gave Jesus not just words or promises about her love. She put those words into direct action. She did not consider the cost because her love was greater than financial considerations. We need so very much to learn the lesson which Jesus understood about generosity when he publicly approved of what she did. Mary had much to be thankful to Jesus for, he had raised her dead brother Lazarus from his stinking tomb, how could she deny Jesus her best perfume? What Mary did was highly provocative, but she was highly motivated and her spontaneous act of loving gratitude could not be inhibited by social etiquette. Her affection for Jesus is an example to us all. Perhaps Mary also perceived that Jesus had but days to live. Wouldn’t we all use our resources differently if we knew that we or our loved ones would be dead within the week? Funerals are a time when people are often criticised for lavish expenditure. How many times have I heard that ‘if all the money spent on flowers had been given to charity it would have been put to much better use.’ But this is to miss the point, they are given out of love for somebody precious and sometimes in the face of death it is all that we can do, because no words can offer comfort or console in presence of such overwhelming loss. We can never be critical of those who spend money on funeral flowers, oak coffins with silk lining or limousines to carry the mourners. But sometimes people at a funeral do wish that they had chance to go back and say something or do something. They regret that they failed to tell show their real love and appreciation. The day of the funeral is too late. The opportunity has passed. Mary, however inadvertently, has seized the moment. She made her grand gesture while Jesus was still alive to enjoy it. So what of us, what are the lessons which we have learn? To be less critical of how other people assess their priorities? To be less eager to gloat at the behaviour of others and more willing to understand and appreciate their motives? Perhaps also to recognise that with every passing day we have less opportunity to demonstrate our love for others, and so we have to make the most of the opportunities of every day. So often when we give to God we do count the cost, we measure the time and make sure that we are not 'going over the top.' When we are responding to the love of God in Christ Jesus we cannot afford to be less than extravagantly generous.